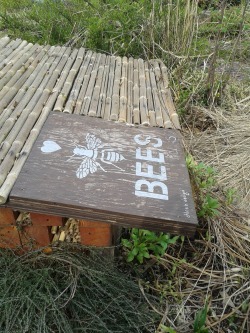 Mason Bee Hotel at 6th & Yew in Kitsilano. This house available for sale. Contact kitsecoarts@gmail.com Closing date: April 30, 2013. Read in Metro Vancouver by Kyle Farquarson that the bees are wanting the sunshine, but bumblebees are not so badly off because they shiver. Elizabeth Elle from SFU is quoted. You can see videos of Elizabeth here.